All you need to know about the 'g' version of Genie Scout for Football Manager 2018. 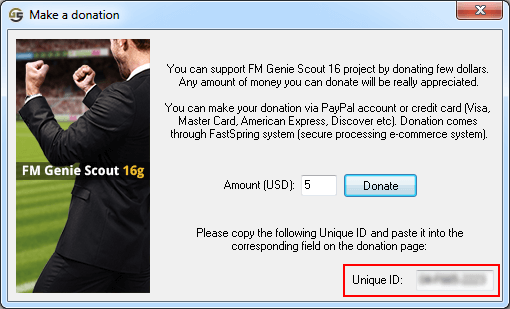 After the donation you will receive an e-mail with the link to download Genie Scout 18g and a key.g18 file (the key file might arrive in a separate email). First beta 1 build 801 was made available on 27 October 2017. Current beta 26 build 826 was released on 27 June 2018. Beta 7 introduced the first part of the brand new feature GS STATS and with Beta 8 the full implementation was complete. Current build 825 is compatible with FM 18.0.1, 18.0.2, 18.0.3, 18.1.0, 18.1.1, 18.1.2, 18.1.3, 18.2.0, 18.2.1, 18.2.2, 18.3.0, 18.3.1, 18.3.2, 18.3.3 and 18.3.4 (current). Make sure to have FM18 open and a game loaded there. Make sure to have your game saved before trying to load it in GS18g. 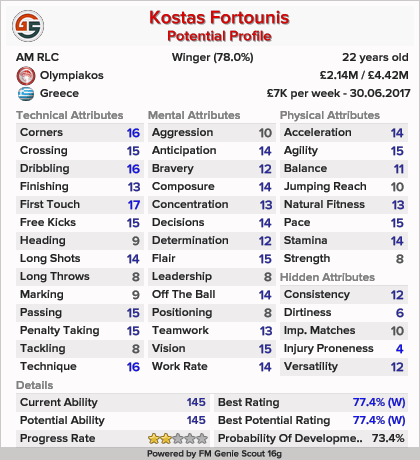 GS Stats - Brand new feature of Genie Scout 18g providing with in-depth player development knowledge based on the history of thousands of games. As the public edition of GS18 won't be made available til late November, you can find your Unique ID in older versions; more specifically GS17, GS16, GS15, GS14, GS13, GS12 or GS11. What to do with the key.g18 file I received in the email? In order to make GS work properly, you have to place this file into FM Genie Scout 18g directory (by default 'C:\FM Genie Scout 18g'). I donated for GS17g. Do I have to donate for GS18g again? How to make in game genius scout available? can i just simply reply the activation email to get another key file? You are reading "Genie Scout 18g FAQ".